My local paper reports a “critical” review is underway to improve public transport access to Wolverhampton’s New Cross Hospital. A new £4m multi-storey car park is being built on the site, but the Hospital’s Chief Executive David Loughton is branding it “a waste of money”, and wants more people to use buses to get to the site. A laudable aim. But one that is fraught with difficulty. Local Councillor Milkinder Jaspal has commented that Authorities had “failed miserably” to provide adequate public transport to the site in the past few years, but I’m afraid the situation is far more complex than that. New Cross suffers from the classic complaint – not enough parking and awful access. Local buses to the front of the hospital have always been good. A high-frequency service (59) passes during the daytime, but the problem lies within. Many services used to traverse the large site, bringing people literally to the door of many wards and departments, but the problem was always indiscriminate parking. So the bus operators decided that enough was enough and pulled out. A few low frequency routes still brave the inside, but the high frequency ones stay outside of the wall. The problem isn’t confined to New Cross. I used to work at Russells Hall Hospital in Dudley. During 15 years working there and at other hospital sites in the Dudley Group, I spent a lot of my spare time developing a Green Travel Plan (even before they became popular!) to address the problem of too many cars on too small a site. To this day, the issue hasn’t been solved. I’ve long since left the employ of the NHS, but on occasions I pass through Russells Hall on the bus and see that not a lot has improved. 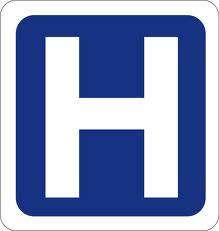 Another problem is the provision of service to Hospitals. Much of the parking problem is staff. And much of the issue is where they live and the hours they work. I had many meetings with bus operators during my time with the NHS, and achieved limited success in getting them to try some earlier morning journeys on a commercial basis to see if staff would use them. But this is always a gamble for the operator. Staff drive in from a diverse array of areas these days. And they often arrive early, say 6am in some cases. Back in the 70s, staff minibuses would drive around the local area picking up employees, but they often live a lot further away these days. So they drive. Which clogs up the car park until, say, 2pm, when the afternoon staff arrive. Bus services can often be of a good frequency at that time in the afternoon, so could staff be persuaded to catch the bus to work? Give them a special cheap pass, dangle the carrot of no parking worries? Of course. But then they finish late. Staff starting at 2pm may well finish at around 10pm. I found this a real headache when I was developing the travel plan. No bus operator wanted to run higher frequency services that late, and Centro weren’t keen on subsidising additional journeys either. Staff were worried about waiting for buses in the dark in the middle of winter, and in any case, the nature of some NHS jobs mean that you can’t walk off the job spot on time. What if you finish your shift at 10pm and your hourly bus service departs at 10:10pm? If you are delayed leaving by 10 minutes you might have missed your bus for an hour, or the last one of the evening. So staff inevitably drive, which brings more and more cars, more and more congestion, and annoys the bus operators because they get stuck around hospital sites which impacts on the wider service provision. Hospital security staff are often reluctant to clamp down on bad parking as they aren’t often aware of the circumstances related to the awkward parking. What if the person’s relative has been rushed in? They’ll park where they can and not care about the consequences. Hospital car park charges also lead people to “rebel” and park on surrounding roads to avoid the charge, also impacting on local bus service provision. Hospital provision too has seen the development of many huge “super hospitals” in recent years, built using private finance. The same issues as described above pop up again and again. New Cross in Wolverhampton, Russells Hall in Dudley, Walsgrave in Coventry, QE in Birmingham. All are massive, and all provide challenges for bus operators to serve effectively. So it is all too easy for Councillor Jaspal to say that public transport access to New Cross has “failed miserably”. The whole issue requires dedicated time, effort and finances to tackle truly effectively. And I’ve yet to see any local hospital succeed so far. In Edinburgh the old Royal Infirmary was central to the city - on a very valuable site which developers were keen to profit from, and naturally this would fund a very nice new hospital, but despite having a number of switch-over sites close by (brownfield city centre development sites), a location was selected outside the city centre. With the move to an out of town location the car -other mode ratio practically inverted overnight, but worse that that, despite many of the ancillary workers living less than 2 miles away in housing 'schemes' the management of the site failed to deliver connections to direct walking routes, blocking them off with the security fenced boundary, and leaving only an unlit national speed limit road without a footway as the connecting route - even the 'cycle' route provided had (avoidable) steps in it. The result an out of town site that has to have propped up bus services and horrendous parking issues. Glasgow is repeating the same mistakes - locating their new regional hospital nowhere near any existing rail and bus corridors with stopping points, when ironically the closed of railway goods yard sites in the centre of Glasgow, which displaced the university and linked hospital sites in the mid 1800's were available for development - we had an ideal location - central with rail services to almost every part of the region served within 30-40 minutes, and other key NHS sites in Glasgow 15-20 minutes by rail or bus. But of course the transport costs don't impact the Capital and NHS budgets in the way they really should given that the location decision has such major ramifications. It does make you wonder though, with the cash strapped NHS, why £4m is being spent on a car park as multi storey ones don't come cheap per space - rail ones at Preston and Wigan cost £23,000 per space and at Penrith 30 extra spaces cost £2.5m (£83,000/space - possibly the current UK record?) which certainly won't get amortised fast at £4/day. PS My dad died in Walsgrave in 1995 (that's another story about what should have been a simple operation going wrong), and the way the site was managed regarding cars and parking abuse was appalling, but equally the delivery of public transport, taxis and cycling for those coming from further than a sensible walking distance was equally ill thought through from the very basic planning position. Dad's girlfriend, who doesn't drive couldn't visit him without someone with a car providing a lift due to the mess of bus and rail connections she had to make - the actual journey times were relatively short but the time taken by waiting and walking for the connections was the detail that made public transport so unattractive. The rally damning detail is that on the site viewed in plan there is a greater land area taken up to provide car parking than that used to accommodate the hospital buildings - something seriously wrong in that.